… they can take a forgotten or just plain underplayed tune and make it beautiful and relevant once again. The irreverent, fun approach taken by Aaron Jonah Lewis, Lindsay McCaw and Ben Belcher is what draws you into this record. Happiness, fun times and a love for the tune springs from the imaginary grooves of the record (I had to listen on CD I’m afraid). I feel incredibly happy this music is in the world! Tunes like ‘Bacon and Eggs’ make you smile instinctively, the tale of a waitress taking the same order all day, Lindsay’s voice having a world weary but almost smirky (in a good way) quality to it. Couple this with the exuberant, couldn’t care less, wailing fiddle, and you find yourself dancing around the kitchen on a Sunday Morning (I did). Even “Little Black Train” a tale about your impending death and subsequent judgment has a humour about it. Yep, it’s got it in spades, twin fiddles, frenzied claw-hammer Banjo, all rolling around and combining into one glorious sound. This is helped by the fact these are all live studio recordings, all three players standing around a single condenser microphone. * Stepping in to take a solo, pulling away to give another instrument room, leaning forward to sing. 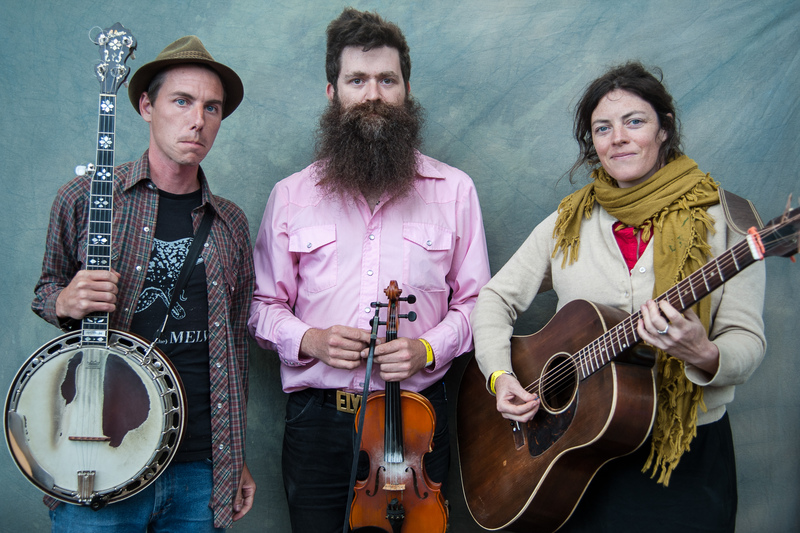 A shining example it’s performers, tunes and songs that make great records. Not technology. I can’t stop singing “Raleigh and Spencer”, I can’t stop whistling “Russian Rag”, there are more catchy tunes here than you need, and every one is a catchy tune. 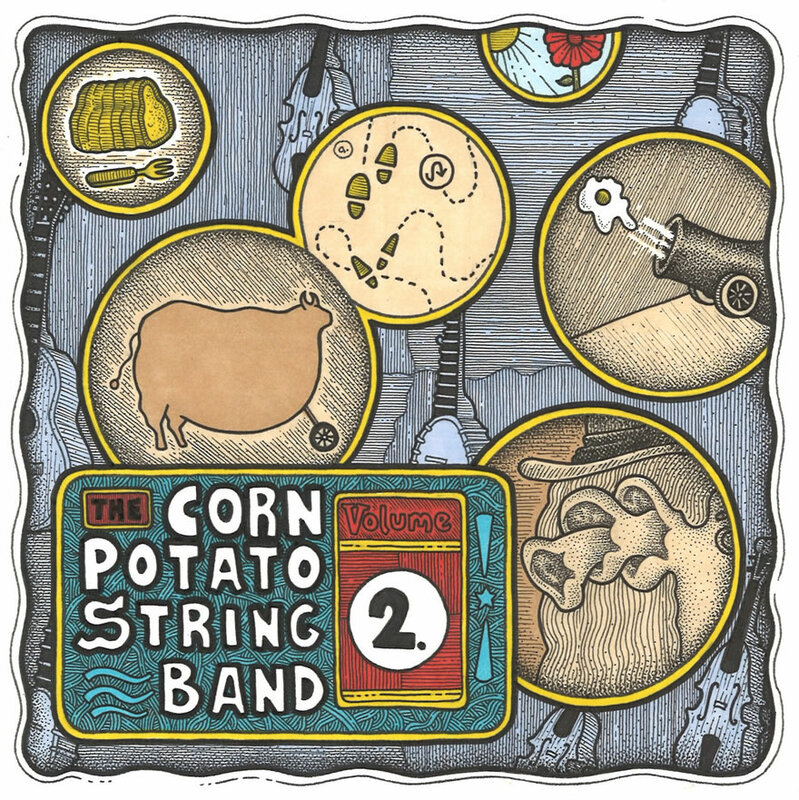 It is a testament to The Corn Potato String Band that they can take a forgotten or just plain underplayed tune and make it beautiful and relevant once again. It’s like finding an old photo album and realizing that the people inside, although long dead, were once young and beautiful, filled with vitality and life. The treatment of the tunes and songs is not revenant or stuffy. It is not the academic, dry approach of string bands like The Black Twig Pickers. It is something more than that. Take the rendition of the old chapel hymn “When can I read my title clear”, it is approach with a subtlety that makes you appreciate this was a working tune, sung by ordinary folk in chapel on a Sunday. Lindsay and Aaron combining their voices to take you back to the wooden floored, clap boarded frontier place of worship we recognize from any sixties spaghetti western. Whilst the all-out exuberance of “Silver Lake Polka” could be played in a kitchen with a jug of hooch on the side, or in a fancy parlour with Sherry served on a Silver tray. On top of this reworkings of standards such as “Cumberland Gap” take your breath away. Simply stunning. The CD doesn’t quite do them justice. I was fortunate enough to watch them live in Rothesay in Scotland last year. Absolutely loved them. Buy the CD as a precursor to watching them live……..well worth it. They’re very cool. Glad to discover them! !